The piece is signed 1818. 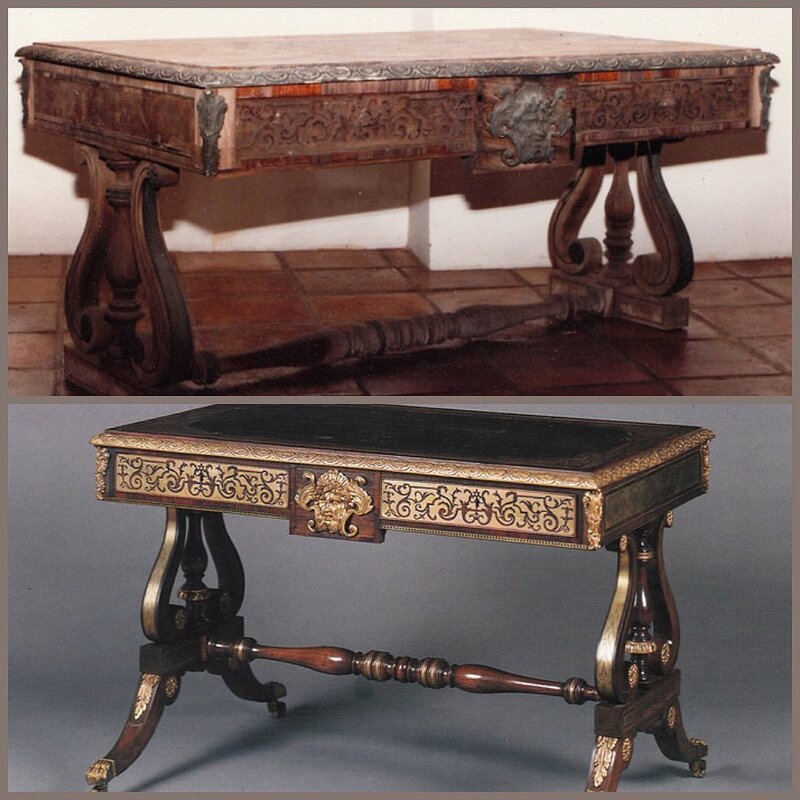 This example of early American Empire style was veneered with rosewood & satinwood on mahogany & poplar secondary woods. These woods and the veneers are difficult to find these days and when you do find them you pay for them; having said that, they are worth every penny you’ll spend. 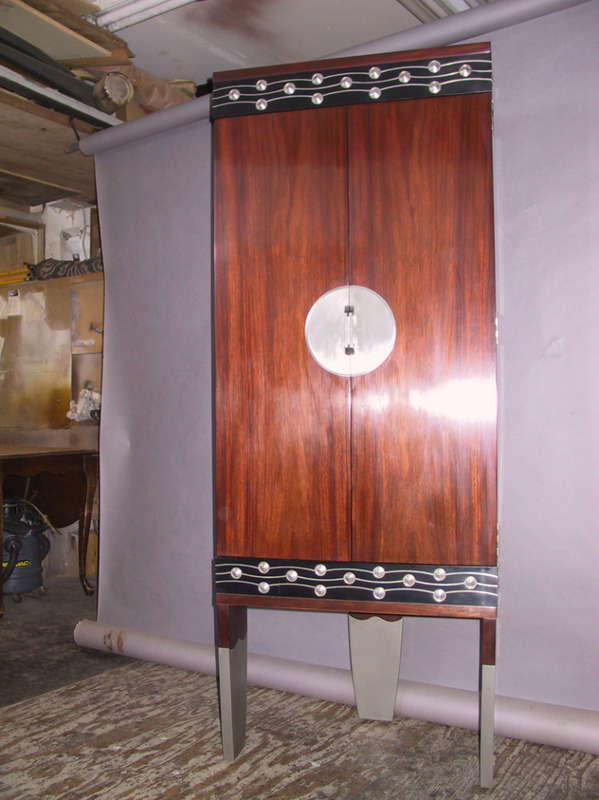 Antique furniture restoration is more costly to undertake but by going to the trouble to maintain the authenticity rather than ‘fake’ the furniture repair, the value of the piece is more likely maintained. I added new bracket feet, and refinished the top of the desk as it had a candle burn. Multiple veneer losses were made good as you will see from the photos. The original color appears under the drawer pulls. The flame patterned veneer & cross grained banding on the highly figured drawer fronts strike a richly decorative pose. This is a beautiful piece of furniture and it was my pleasure to work on it. I posted the images of this desk here on the website and also on my facebook page; http://facebook.com/plumstudio2 and I’ll put up some other samples of the butler’s desk as well so you can compare them. What is a Butler’s Desk and what was their function? 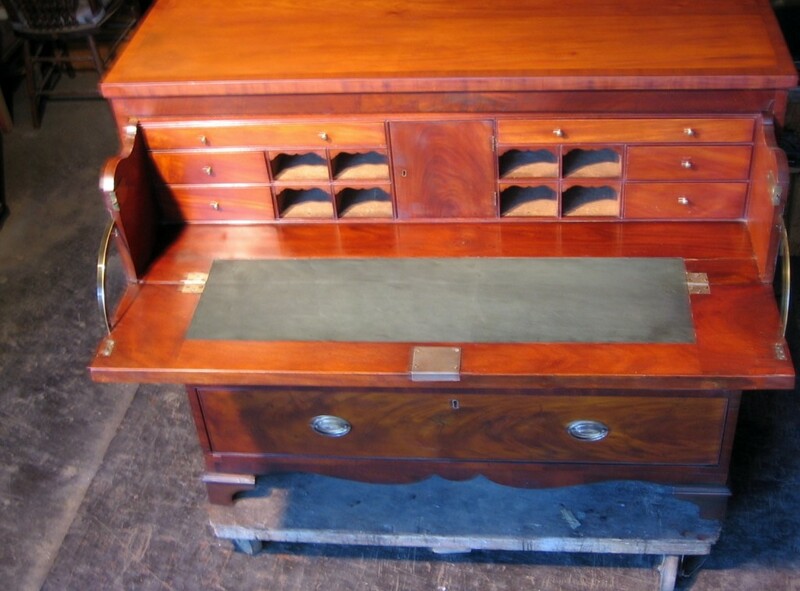 For those of you who may not know, a butler’s desk is a piece of furniture that was designed for those who were in service in estate homes and ‘fine houses’ owned by the wealthy. The design of these highly serviceable desks evolved as those in service did. At first the indentured servants of both the European and American estates were not typically literate but as time went by the Butler of the house was required to have a formal education. Interesting to note here that in fact, much of the aristocracy could not read and write but with the increasingly literate upper crust, the demand for a better informed class of educated servants also grew. While the ‘Lord’ of the house held the final say on all matters of the household his need to delegate tasks to his highest ranking servants,like the butler,necessitated a location where specific records could be kept in order and referenced as needs be. Some of the earlier examples of the butler’s desk was a high desk, so to speak, because the person using this would be standing. There were many drawers of different sizes all fitted with locks. Bearing in mind that there were not factories that turned these desks out in uniform fashion. They were custom designed pieces of furniture and the size of the drawers were set to be used for storing different sized documents. It wasn’t uncommon to have secret compartments in these desks and that typically housed very important documents that only the head butler was entrusted with by the Master of the house. This desk that came in to my shop for restoration was custom built in 1818. 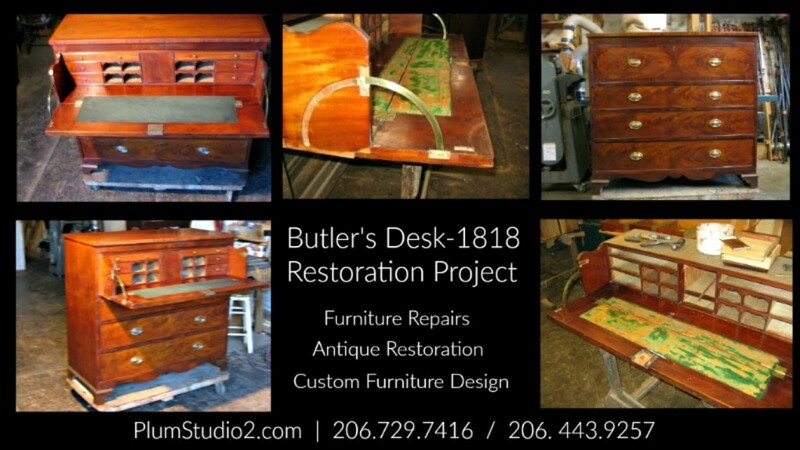 By the 1850’s the butler’s desk had morphed into a more stylistically diffused piece of furniture. It became more oriented to a type of overall manager and household coordinator. At that time the taller of these were abandoned and these more practical desks took its place. Since the butler’s desk was so utilitarian it was usually quite plain in design. Later on, however, during the second half of the 19th century they began to have decorative featured details like the spindled gallery. They were custom designed and obviously hand made from the late 18th century and they remained popular for the next 100 years. I wonder if any of you Downtown Abbey fans has seen this type of desk in use? Mr. Carson must surely have one! 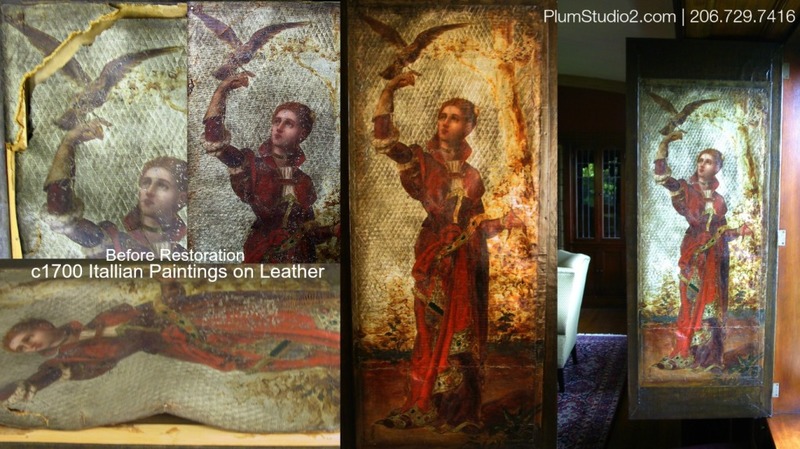 If you happen to have antique furniture you’d like restored to its former glory, give me a call. 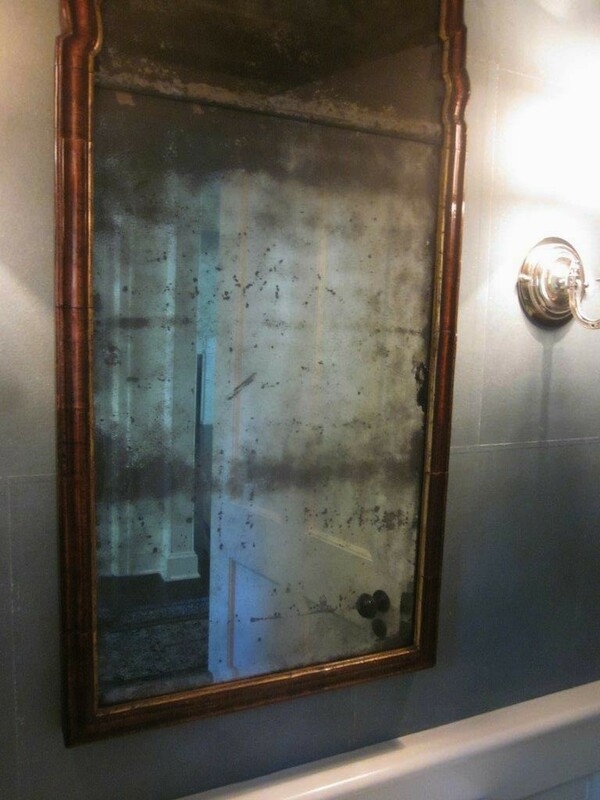 Estimates are free of charge and frankly, I really enjoy seeing these old beauties.